We don't think we should aim for a physical resemblence, to dress identically, to copy the moves, or any other thing that would make us merely an imitation. Instead, we think that the best way to make a tribute to artists is to incarnate their spirit, trying to interpret their thoughts, to express their feelings and to communicate to the audience their true artistic nature, through spontaneity, passion, and the enjoyment of playing their songs. The result should be a sincere and honest tribute to the most exciting band of all time. Since 1995 we have had many different experiences, both positive and negative; having received compliments and applause and a few criticisms, some polite, some fierce. We have seen a proliferation of Queen tribute bands (perhaps too many!) And felt this project may already be overdone, but we kept going, and having sewn the seeds during this time, we feel that today we are reaping the fruits of our labour. Over the course of the years we have grown professionally, improved our performance (both technically and artistically), refined our sound and instrumentation (the re-creation of the Red Special by Giacinto with the same specifications as the original was just great! ), and broadened our repertoire. 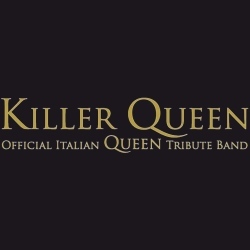 We are honoured that the official Italian Queen fan club 'We will rock you' continue to recognise us as the official tribute band in Italy. This recognition distinguishes our work and makes us very proud. Die Info ist der Band-Website entnommen.